So I spent the morning waiting outside United Art & Education for their annual teacher "surprise" giveaway! It was a little cloudy but I figured I'd tough it out with my camping chair and umbrella. After about 20 minutes it started to sprinkle so the manager let us in early - what great customer service! I only had a $5 dollar gift card this year but that was all I needed to purchase my new job bulletin board set! My job board is old and starting to fall apart so I've been wanting a new one... so I found this gem on sale for $5.59! If you're interested in this job chart you can find it here. It actually WORKS! The lamination is really thick. Much thicker than our school lamination! I was quite shocked at how well it all came out! I'm going to have to purchase a few more pouches! I wouldn't use it for everything (that could get pricey & school is free) but something that needs to be more durable... for sure! Two penny-pinching thumbs up! Worth the money! I took the premade job signs and laminated those. I also had to create a few of my own jobs. I used some scrapbook stickers I already had that were bright colors to create some new jobs. Below are two jobs that I added to the blank signs... I have a homework collector that collects each day's homework and a two students carry our lunch bin down to the cafeteria and bring it back after recess. After all the jobs were laminated, I took some Velcro to affix the student plates. There are little slits that you can slide jobs into but oh that would get tedious! Plus, I laminated mine shut! Once I get into my classroom I'm going to create my board! It wasn't entirely created by me... but, I like to think it was a semi-Monday-Made-It project sort of like the Food Network show, Semi-Homemade! 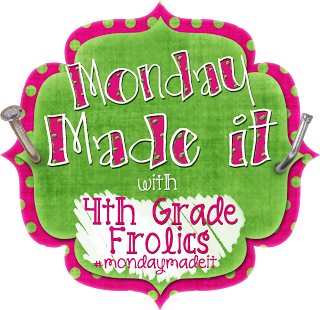 Don't forget to link up with Tara at 4th Grade Frolics to share your Monday Made Its! Love your phrase, "Two penny-pinching thumbs up!" Super cute. I'm excited to hear about your laminator. Does Walmart sell replacement film?